Income inequality has been a thorny issue in the United States throughout the previous century. Now, financial disparity seems once again to be growing, with a new study painting an uncertain future for many in the country. The US national debate has been absorbed over recent months with the Roman circus that has been the media storm surrounding Donald Trump’s controversial Presidency, with most of the discussion focused almost exclusively on alleged collusions between the new White House administration and Russian cyber criminals. Amid the continued uncertainty surrounding the current White House, the economy has continued to grow, in spite of growing global concern. However, the growth seems to do little to assuage growing inequality in the United States, an issue which in a more conventional Presidency might have come to the fore sooner. The divide between rich and poor has debatably never been greater in the USA, and certainly never so emphatically illustrated, with a billionaire business magnate spending public funds heavily on trips to Mar-A-Lago, while attempting to dismantle a health care system implemented by the previous administration to give health insurance to society’s most deprived. 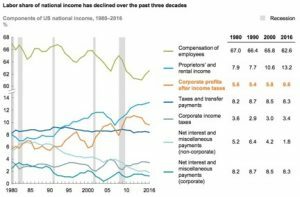 In a new report from McKinsey & Company, titled ‘Making it in America’, the research arm of the consultancy firm lays bare the changing dynamics for labour income in the US. The research explores changes over the past five decades, as well as considering the future for the country’s working-class and middle-class populations in Trumps America – while drawing the troubling conclusion that hard work does not unconditionally pay dividends, even in the self-styled land of opportunity. In spite of the claims of the keepers of the flame of Reaganomics, trickledown theory economics appears to have failed to benefit anyone but the wealthiest Americans, having first been implemented in the 1980s during former actor Ronald Reagan’s two term Presidency. 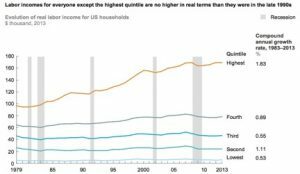 Income for the lowest two thirds of the US population has been effectively stagnant since the recession in 1983, even falling in real terms relative to the troubled late 1970s. Income for the highest quintile, however, has grown in leaps and bounds since the early 80s, at CAGR 1.83%, with income for the group increasing more than the total income of fourth quintile to around $160,000. McKinsey’s researchers note that some groups have taken harder hits than others. 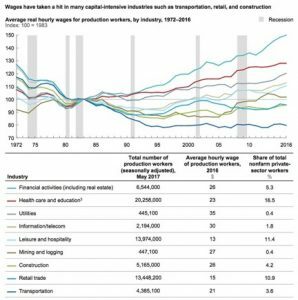 While much of the new work since 2010 has gone to lower wage industries, the vast majority of new hires – 99% of the 11.6 million jobs added from the bottom of the recession through to 2016 – went to those whom have at least some college education – while 77% of the 7.2 million job losses in the recession affected those with a high-school diploma or less. A lack of job creation for higher paid “white collar” jobs has seen graduates increasingly forced to compete in “blue collar” sectors, leading to those without paper qualifications increasingly unable to land unskilled work, while many of the ‘new’ jobs are placed in the hands of those whom are overqualified for them, presenting a huge waste of talent in both directions. Under 35s meanwhile, who tend to have a college qualification and are subsequently lumbered with student debt, have seen their real wages shrink significantly since 1983. With graduates now less able to repay their loans, national student debt has lept to $1.34 trillion in 2017, from $400 billion in 2005. 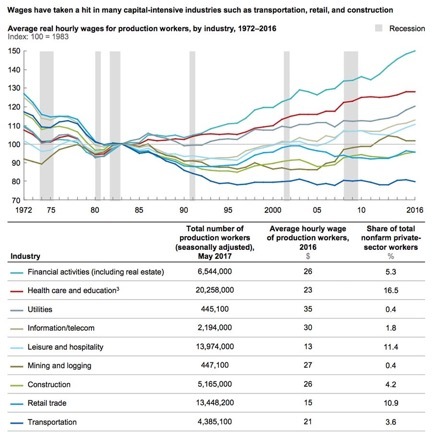 While wages across have remained stagnant across most income quintiles for the past almost fifty years, various industries have seen wages decrease over the period since 2983 – particularly those in capital intensive industries. The biggest drops were noted in transportation, retail trade and construction. Retail trade remains one of the country’s largest private sector employment sectors, at 10.9% of the total working population. Unsurprisingly perhaps, financial services have seen by far the biggest increase, almost doubling its Index score, while the sector employs around 5.3% of US private sector workers. The study suggests that the structural conditions, which affected real wage growth even before the recession following the financial crisis, are set to continue to affect real wage growth for workers, even if recovery continues. 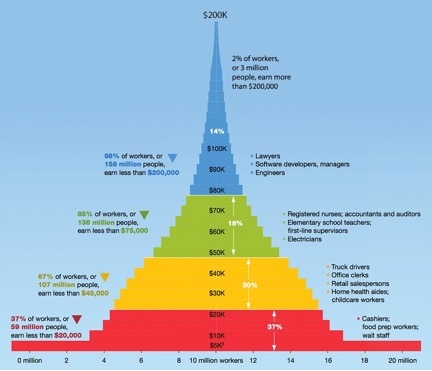 These conditions pertain largely to technology shifting productivity from labour intensive processes to knowledge intensive processes; in addition, competition has heated up in various sectors, while the number of potential employees has increased – creating an increasingly uneven playing field between labour and capital, which has affected wages and employment levels for lower-skilled workers. In addition, the firm notes that capital-light industries tend to be out performing capital heavy industries, while across the board the research points to “superstar” companies, gobbling large amounts of profit, creating rich rewards for their workers, while depleting the rest of the industry of success. A recent report into corporate profit found that there is considerable profit inequality between firms, 10% of corporate entities hover up 80% of profits. The increased pressure on labour is reflected in its declining share of national income – even while the higher income quintile has seen its share of total labour income increase significantly. In total, compensation for employees has fallen from 67% of total income in 1980 to 62.6% in 2016. Meanwhile, corporate profits have skyrocketed, up from 5.6% in 1980 to 9.6% in 2016. Aside from facing stagnating wages, various aspect of necessary costs for workers have continued to rise. Proprietors’ and rental income has also increased significantly, from 7.9% of total income to 13.2%, while house prices have become unaffordable for large numbers of US workers. As such, rent and basic utility bills now eat up around 50% of the income of the lowest paid workers in the US. Workers are finding a range of barriers to gainful employment, including increased skills mismatches, fewer pay-roll positions as companies increasingly outsource, utilise contractors or use temporary workers. In addition, companies have started to hollow out benefits, while poor health – and no access to quality insurance – means that many workers face internal and external barriers to employment. Switching jobs too has become more difficult with ‘non-compete’ agreements limiting their options, as well as changes in market dynamics to urban areas, while moving has become increasingly difficult, the number of individuals relocating in a given year, is near 12%, down from 20% in the mid-1960’s. The research notes that the future for many US workers, particularly on low incomes, is relatively bleak. In line with trends across the Western world, the market is moving toward less secure work, from outsourcing to contracting, is set to see 32 million that undertake independent work as their main income. This group has no benefits, and is often not paid the full cost of their labour – reducing their ability to save for retirement, illness and other areas in which nominal workers have protection from risks. Particularly the low-skilled in this group are set to find life increasingly onerous. In addition, new forms of automation, which boast lower costs and higher productivity, have the potential to significantly affect employment levels within various sectors. While in the UK recent projections suggested AI may only create jobs to replace 19% of the jobs it ends, this figure could be even higher in the US – particularly for low-skilled, physical labour positions. Accommodation and food services, manufacturing and transport and warehousing, areas that represent a large segment of the labour economy, could see more than 60% of current activities automated over the coming decades. The firm notes that there are looming questions for the US, particularly as inequality as such is set to rise, while the country’s major infrastructure continues to show signs of decay. While the need to invest in infrastructure could conceivably create an employment boom in the country, little movement has so far occurred to actually realise that, while the pay and conditions of any such work may well fit with the national trend that will see the subsequent labour created valued excessively lowly anyway. MYTH: The ACA is a disaster. TRUTH: The ACA brought health insurance to more than 20 million people. The percentage of people who are uninsured in the U.S. is at a record low . MYTH: The ACA is a job killer. TRUTH: The ACA has led to record job growth especially in health care . States that expanded Medicaid saw high job growth and increased revenue . MYTH: The ACA is a government takeover of the health care system. TRUTH: The ACA is based on conservative free market principles that were used by Republican Governor Mitt Romney in Massachusetts . This is why insurance companies are able to increase premiums or leave the exchanges if they choose. MYTH: The conservative notion of providing tax credits and expanding health savings accounts would effectively replace subsidies. TRUTH: For people trying to make ends meet, the ACA subsidy covers about 85% of the insurance premium. Tax credits will not compensate for this financial assistance. Tax credits and health savings accounts mostly benefit people with higher incomes . MYTH: The ACA caused insurance premiums to skyrocket. TRUTH: Premiums did not increase in all states. The higher premiums are offset by higher subsidies. . MYTH: Selling insurance across state lines will lower costs for consumers. TRUTH: Selling insurance across state lines will not drive down costs. It is already permitted and hardly any insurance companies do it. Companies that sell across state lines are likely to locate in states with weak regulations to charge more and provide less coverage . MYTH: Discontinuing Medicaid expansion will be good for our health care system. TRUTH: Politicians would take away care, treatment and medicine from 11 million people now covered under Medicaid expansion . In states that expanded Medicaid, community health centers and hospitals had increased revenues . In states that did not expand Medicaid, hospitals had financial problems and some had to close. Hardest hit were rural counties, the areas that voted heavily for Donald Trump . Uberoi N, Finegold K, Gee E. Health Insurance Coverage and the Affordable Care Act, 2010-2016. March 2016. US Department of Health & Human Services. ASPE Issue Brief. Available at: https://aspe.hhs.gov/system/files/pdf/187551/ACA2010-2016. pdf. Accessed February 27, 2017. Livingston S. Healthcare Drives Yearly Job Growth. January 6, 2017. Modern Healthcare. Available at: http://www. modernhealthcare.com/article/20170106/NEWS/170109951. Accessed February 27, 2017. Bachrach D, Boozang P, Herring A, Glanz Reyneri A. States Expanding Medicaid See Significant Savings and Revenue Gains. Robert Wood Johnson Foundation. Available at: http://www.rwjf.org/content/dam/farm/reports/issue_briefs/2016/ rwjf419097. Accessed February 27, 2017. Calsyn M. Romneycare Versus Obamacare: Two Names; Same Model. Center for American Progress Action Fund. July 2012. Available at: https://cdn.americanprogress.org/wp-content/uploads/issues/2012/07/pdf/romneyu_romneycare2.pdf. Accessed February 27, 2017. Emanuel E, Kocher B. Higher Health-Insurance Premiums Don’t Mean the Affordable Care Act is a Disaster. Washington Post Opinions. October 27, 2016. Available at: https://www.washingtonpost.com/opinions/higher-health-insurance-premiums­dont-mean-the-affordable-care-act-is-a-disaster/2016/10/26/1b7f7ce0-9b84-11e6-a0ed-ab0774c1eaa5_story.html. Accessed February 27, 2017. Grant R. Replacing ACA Would Harm Economically Vulnerable Persons and the Health Care Safety Net. February 20, 2017. JAMA Forum. Available at: https://newsatjama.jama.com/2017/02/20/jama-forum-replacing-aca-would-harm­economically-vulnerable-persons-and-the-health-care-safety-net/. Accessed February 27, 2017. Blumberg LJ. Sales of Insurance across State Lines: ACA Protections and the Substantial Risk of Eliminating Them. Urban Institute. June 2016. Available at: http://www.urban.org/sites/default/files/publication/81866/2000840-Sales-of-Insurance­across-State-Lines.pdf. Accessed February 27, 2017. Cross-Call J. Repealing Health Reform’s Medicaid Expansion Would Case Millions to Lose Coverage, Harm State Budgets. Center of Budget and Policy Priorities. December 22, 2016. Available at: http://www.cbpp.org/sites/default/files/atoms/ files/12-22-16health.pdf. Accessed February 27, 2017. Rosenbaum S, Paradise J, Markus A, Sharac J, Tran C, Reynolds D, Shin P. Community Health Centers: Recent Growth and the Role of the ACA. January 18, 2017. Kaiser Family Foundation, January 18, 2017. Available at: http://files.kff.org/attachment/ Issue-Brief-Community-Health-Centers-Recent-Growth-and-the-Role-of-the-ACA. Accessed February 27, 2017.
equity, and justice under the Trump administration. questions or edits, please email: 100dayplan@humanimpact.org. 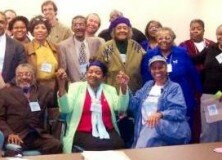 but they will also be at the forefront of the fight for environmental and climate justice. Under President Obama, the needs of EJ communities were on the policy agenda, through initiatives like the Federal Interagency Working Group on Environmental Justice.. While those efforts had mixed success in improving health and environmental outcomes, they helped to institutionalize an understanding of race, class, and pollution in federal agencies and created important points of leverage for communities. In this way, they fed into a set of political and social conditions that allowed our movements to grow. These points of leverage will most likely be eviscerated under a Trump administration. Trump and his cabinet nominees have promised to weaken environmental regulations under the Clean Air Act, Clean Water Act, and other laws. If Trump succeeds in appointing ExxonMobil CEO Rex Tillerson as secretary of state, Big Oil will have a whole new kind of foothold in American policy. And with Scott Pruitt as head of the Environmental Protection Agency and Ryan Zinke at the helm of the Department of Interior, we can expect a retreat from federal action on climate change and a full-throttle expansion of fossil fuel development. Oil and gas infrastructure like drilling sites, pipelines, and refineries are typically located in low-income communities and communities of color. Here in California, fracking happens in the rural fields of Kern County — a predominately Latino area. California’s refineries, from Richmond to Long Beach, are located next to diverse, low-income communities. These are the areas where drilling will expand and new pipelines will be built. For low-income communities and communities of color, the disproportionate burden of pollution will only increase. That means more “code red” air quality days, more trips to the ER for asthma sufferers, more cancer and respiratory disease. As climate change worsens, it will be low-income people who lack the means to evacuate before major storms, and don’t have money for air-conditioning when heat waves roll through. We’ll see Superstorm Sandy and Katrina on repeat. And climate change will be layered on top of other threats — from increased deportations to the loss of health care if the Affordable Care Act is repealed. But as we have seen in the inspiring protest at Standing Rock, frontline communities also o er the most hope for resistance over the next four years. Our communities — as always — will be the battlegrounds, and we are prepared to fight. We have a stronger movement than ever before. From the People’s Climate March, which was led by communities of color, to inter sectional alliance-building with groups working on immigrant rights, gender justice, and more, we are linking our e orts together. 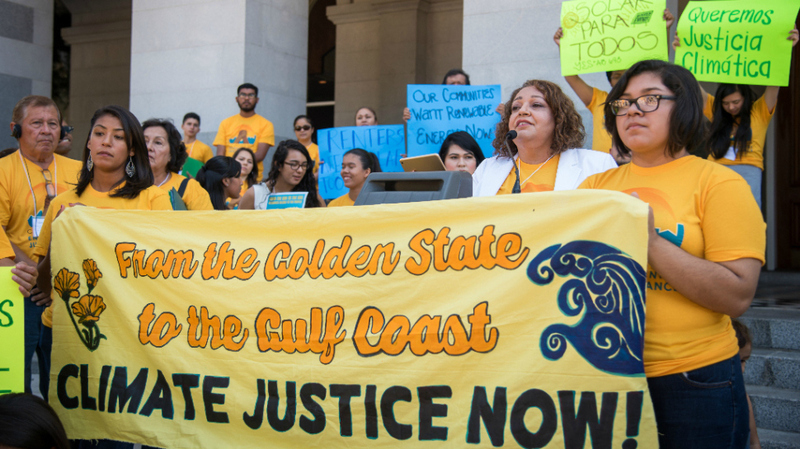 We are demonstrating that climate and environmental policy must go hand in hand with justice for people of color. And, even in Trump’s America, there are real possibilities for gains at the city, state, and regional levels. In California, we have opportunities to both protect what we have won and push even further. Our task in California and other progressive areas is to dream big and show that a different path is possible. As we gear up for this critical work, it is more important than ever to invest in the leadership of people of color and indigenous communities. Climate solutions must come from the most impacted communities, and we must look to the leaders of those communities, who are crafting campaigns of resistance and vision. This has always been a key message of the environmental and climate justice movement. Now, under Trump, there is simply no other way to succeed. I teach a medical school course on homeostasis: how organ systems work together to maintain physiological balance. For example, when blood pressure drops acutely, the heart speeds up and the kidneys retain sodium and water, propelling blood pressure back to normal. If body temperature falls, we shiver to generate heat, blood vessels constrict to conserve heat, and we warm up. Homeostasis is about preserving constancy in the face of changing conditions. As a model for explaining human physiology, it does remarkably well. However, there are aspects of the human condition that homeostasis cannot explain. For instance, blood pressure often fluctuates minute to minute. If the body is supposed to be maintaining an optimal set point, it doesn’t seem to be doing a very good job. Blood pressure also increases steadily throughout childhood and adulthood. Why does the set point drift upward? To explain these things, some experts have proposed an alternative theory to homeostasis: allostasis. Allostasis is not about preserving constancy; it is about calibrating the body’s functions in response to external as well as internal conditions. The body doesn’t so much defend a particular set point as allow it to fluctuate in response to changing demands, including those of one’s social circumstances. Allostasis is, in that sense, a politically sophisticated theory of human physiology. Indeed, because of its sensitivity to social circumstances, allostasis is in many ways better than homeostasis for explaining modern chronic diseases. Consider hypertension. Seventy million adults in the United States have it. For more than 90 percent of them, we don’t know the cause. However, we do have some clues. Hypertension disproportionately affects blacks, especially in poor communities. This may in part be because of genetics, but it is doubtful that this is a major factor; American blacks have hypertension at much higher rates than West Africans. Moreover, hypertension is also common in other segments of society in which poverty and social ills are rampant. Peter Sterling, a neurobiologist and a proponent of allostasis, has written that hypertension in these communities is a normal response to “chronic arousal” (or stress). In small preindustrial communities, he observes, people tend to know and trust one another. When this milieu is disrupted, as in migration or urbanization, there is often an increased need for vigilance. People are frequently estranged from their neighbors. Communities become diverse and more mistrustful. Physical and social isolation can result. Add in poverty, racism, fractured families and joblessness, and you get extremely stress-prone populations. Where homeostasis attributes hypertension to a defect of inner regulation, allostasis explains it as a normal response to social circumstances. Chronic arousal prompts release of “stress” hormones such as adrenaline and cortisol that tighten blood vessels and cause retention of salt. These in turn lead to long-term changes, like arterial wall thickening, that increase the blood pressure set point. The body adapts to this higher pressure and works to maintain it. As an example of such arousal, Dr. Sterling notes that blood pressure is often constant till about age 6, but then it rises quickly as children detach from their parents and have to become vigilant against real or perceived threats. By age 17 almost half of all boys have blood pressures in the prehypertensive range, and about 20 percent have full-blown hypertension. In the allostatic formulation nothing is “broken.” The body is responding in the way it should to the chronic fight-or-flight circumstances in which it finds itself. As Dr. Sterling notes, the allostasis model identifies a seeming paradox: People are dying, but their internal regulatory mechanisms are intact. Allostasis is attractive because it puts psychosocial factors front and center in how we think about health problems. In one of his papers, Dr. Sterling talks about how, while canvassing in poor neighborhoods in Cleveland in the 1960s, he would frequently come across black men with limps and drooping faces, results of stroke. He was shocked, but today it is well established that poverty and racism are associated with stroke and poor cardiovascular health. These associations also hold true in white communities. One example comes from the Whitehall study of almost 30,000 Civil Service workers in Britain over the past several decades. Mortality and poor health were found to increase stepwise from the highest to the lowest levels in the occupational hierarchy: Messengers and porters, for example, had nearly twice the death rate of administrators, even after accounting for differences in smoking and alcohol consumption. Researchers concluded that stress — from financial instability, time pressures or a general lack of job control — was driving much of the difference in survival. Today it is clear that chronic diseases like hypertension, diabetes and heart failure are inextricably linked to the state of our neighborhoods, jobs and families. We must use this information in the fight against rising income inequality, high imprisonment rates and other social problems. Allostasis reminds us that to treat our ills we also have to repair our social fabric. We have to look at not only our bodies but also ourselves. Sandeep Jauhar, a cardiologist, is the author of “Doctored: The Disillusionment of an American Physician” and a contributing opinion writer.